Cortec Corporation has offered environmentally responsible packaging and materials protection technologies for over 25 years. We are proud to introduce our two families of high performance, certified biodegradable packaging technologies—Eco Film and Eco Works. Eco Film™ and Eco Works™ are high performance, completely biodegradable and compostable films and bags with unparalleled performance characteristics. Developed with the entire lifecycle of the product in mind, Eco Film and Eco Works combine the performance demanded by customers while in use and convert effortlessly into carbon dioxide and water within weeks of disposal. All Eco Film™ and Eco Works® Formulations are certified commercially compostable per ASTM D 6400 and can carry the Din Certco/IBAW and BPI/USCC marks of conformity. 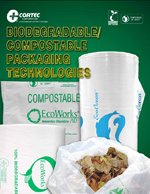 Eco Works® is based in part (5-70%) on annually renewable raw materials. All our film products are extruded at our own facility in Cambridge, MN. Cortec maintains strict adherence to ISO 14001 and 9001-2000 quality guidelines. If you are interested in bulk converting and packaging of Eco Film or Eco Works, please contact Cortec at or call our office at (800) 426-7832.